Brian Lovell owns shares in Imagus Pty Ltd. He has received funding from the Department of Prime Minister and Cabinet. The FBI has released photos and CCTV footage of the two men considered suspects in this week’s Boston bombing, and has appealed to the public to help identify them. Both are young men, wearing baseball caps and carrying backpacks, and are shown to slowly walk through the crowd just before the explosions. But where did the footage come from? When investigating major crimes and acts of terrorism such as the Boston bombings, there is really no evidence quite as compelling as high quality CCTV surveillance video. Indeed, from discussions I’ve had with police in the UK, the home of CCTV, courts and juries can now be quite sceptical unless CCTV evidence is presented. At times, CCTV evidence alone has completely changed the course of investigations. In the case of the horrific murder of two-year-old James Bulger after his abduction from a shopping centre in Liverpool in 1993, police started looking for adult offenders in accordance with normal police procedures. Then CCTV evidence (below) showed that James was taken by two young boys – a fact that completely changed the direction of the investigation. The James Bulger Case depended on CCTV footage. As the boys could not drive, the search then concentrated on local areas and public transport. Sadly, Bulger’s mutilated body was found just 4km away on a railway line. Despite some notable successes, a major problem for police is that there are simply too few cameras to cover most events. Moreover, existing cameras are often mounted high above the crowd, so they are poorly positioned to obtain face images. This is why offenders obscure their faces by wearing baseball caps, as did both suspects in the Boston bombings. Images are often blurred and grainy due to the distance from camera to subject as well as the poor resolution of the legacy analog cameras mostly installed in public spaces. In a major incident investigation involving CCTV, police are faced with daunting challenges. First they have to collect all the relevant CCTV footage before it is automatically overwritten. This sometimes involves impounding the recording systems, as it may be extremely difficult to export video from older systems. Sometimes the video is encrypted and sometimes the manufacturer is out of business. Once the video is collected, police begin the painstaking task of looking through hundreds or thousands of hours of video with a large team of detectives. Since the bombers would not have been near the explosives at the time of detonation, this is a needle in a haystack problem. So how is it done? 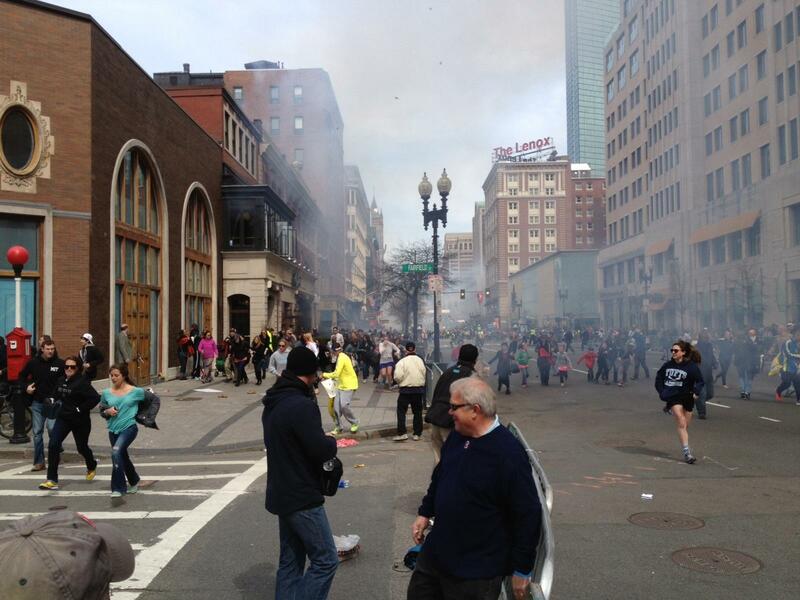 Each person near the bombing would be examined for suspicious packages. In the case of the Brixton Bomber, David Copeland, who placed nail bombs in the streets of London in 1999, it was determined from forensic evidence at the scene that one of the bombs was carried in a Harrods shopping bag. So the police examined hours of CCTV footage tracking similar bags until they found the bomber. The suspects in the Boston Marathon bombing case. In a network of cameras there may be only a few that can provide good face images. One technique used by police is to track persons of interest through the crowd by distinctive articles of clothing until they pass by a high-quality camera that can capture a good face image for identification. Fortunately, distinctive clothing can be tracked from any direction - and even from overhead cameras. Nevertheless, tracking a person through a network of non-overlapping cameras is always a huge task. Other methods are now coming to the fore. Social news website Reddit.com today created a dedicated “find Boston bombers” page on which people can upload photos of the baseball cap-wearing suspects taken on the day of the Boston marathon; and one photo appears to show the white-capped suspect’s face clearly. Such initiatives may help in what is an incredibly difficult task. After the 7/7 London bombings, police examined 2,500 pieces of CCTV evidence. This required the attention of many hundreds of detectives over several months, and even then only about 30% of the video was fully examined. More evidence will be found in the case of the Boston Marathon bombing, but it is perfectly clear, even at this early stage, that CCTV evidence is once again playing a pivotal role.